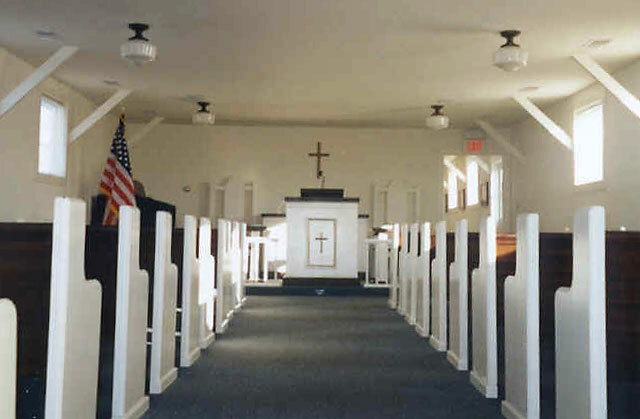 The Jeanne Lewellen Norbeck Memorial Chapel is a restored 1942 barracks building converted to a chapel during the Korean War, dedicated to the memory of Jeanne Lewellen Norbeck, a member of the Women's Air Force Service Pilots (WASP), a non-military group assigned to the ferrying and testing of U.S. Army Air Force aircraft. 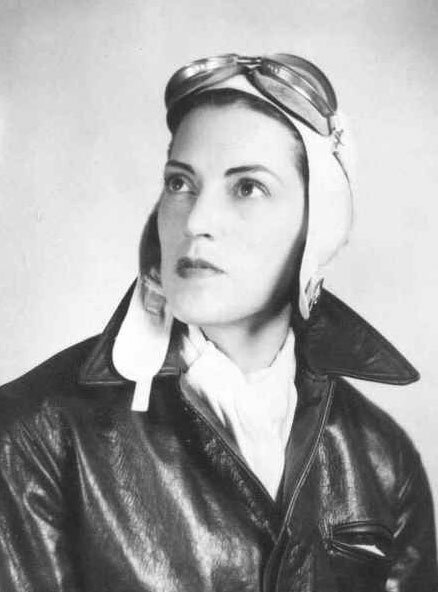 On October 16, 1944 a week after her last visit to Columbus, she was killed instantly when the Vultee Valiant plane she was piloting crashed (learn more much about Jeanne, here). 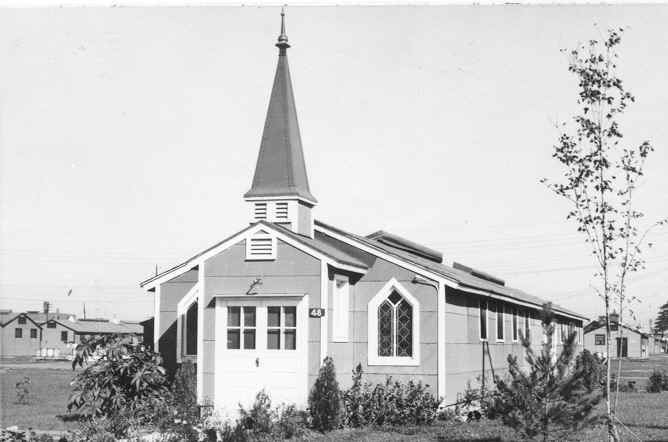 The restored chapel was dedicated on Friday, May 29th, 1998. 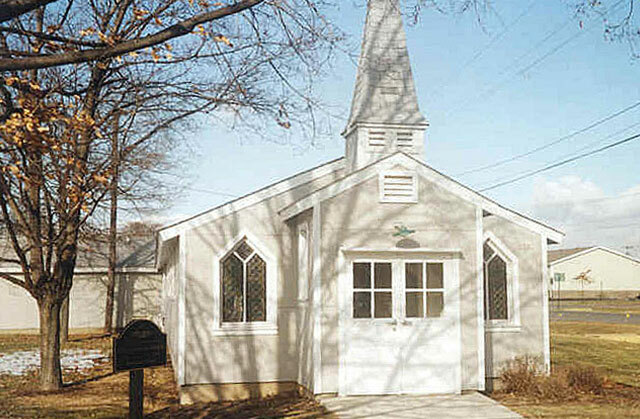 The chapel may be rented by the public for weddings and memorial services, the rental will include a damage deposit. 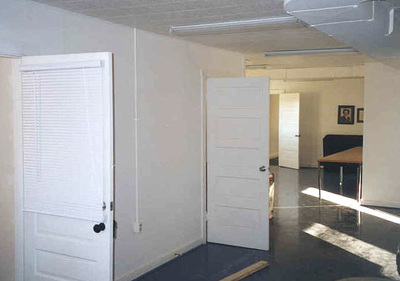 The chapel can seat approximately 80 comfortably. 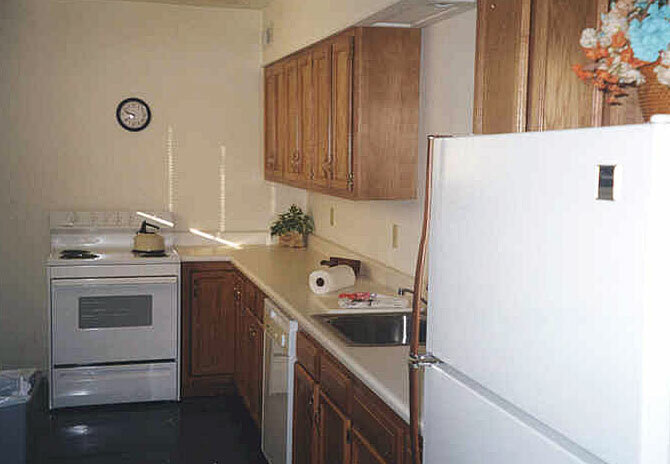 The chapel also has a kitchen and dining area that can seat 46. Please call the museum at 812-372-4356 for reservations. 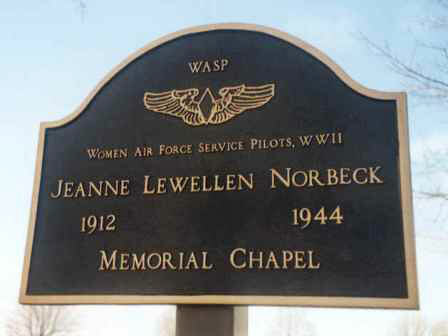 The Jeanne Lewellen Norbeck Memorial Chapel is a restored 1942 barracks building converted to a chapel during the Korean War, dedicated to the memory of Jeanne Lewellen Norbeck a Women Air force Service Pilot during World War II. 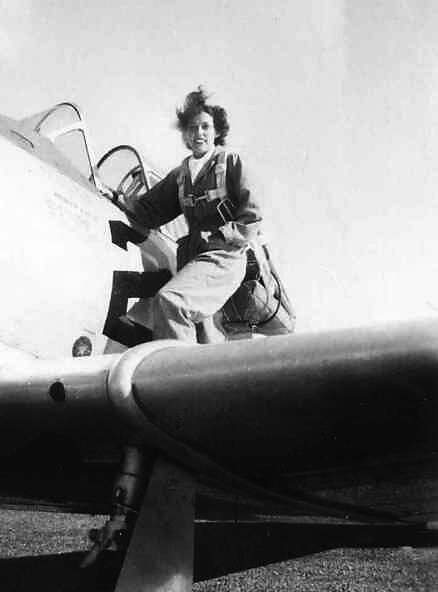 On October 16, 1944 a week after her last visit to Columbus she was killed instantly when the Vultee Valiant plane she was piloting crashed. 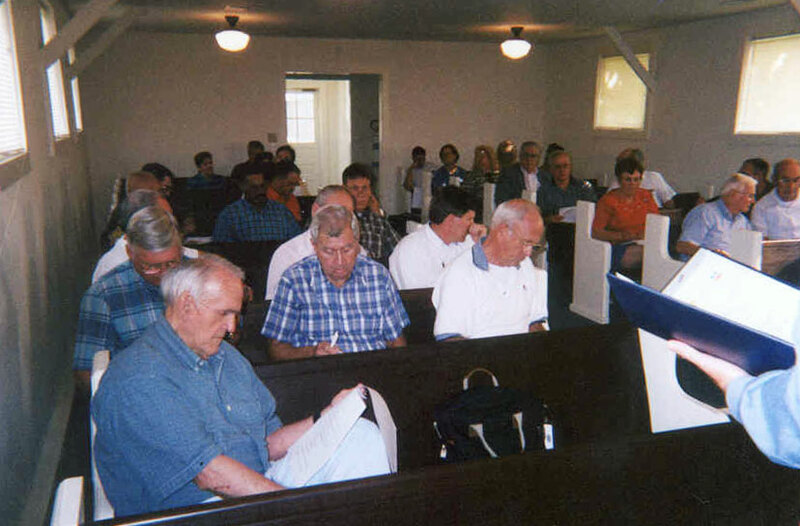 The restored chapel was dedicated on Friday, May 29th, 1998. 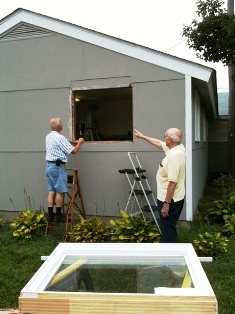 Chapel Building T-48 requires never ending care and maintenance. The Chapel Building #T-48, takes a lot of TLC to keep it maintained like shown here in recent photos where museum volunteers Pete Jenkins and John Walter are seen replacing one of the chapel library windows, Pete Jenkins is on the chapel roof repairing a shingle, and Pete and Wendell Ross are sealing and coating the WWII-era chapel fire lane. The original 1942 base buildings were T, or temporary building, built only to last about five years. 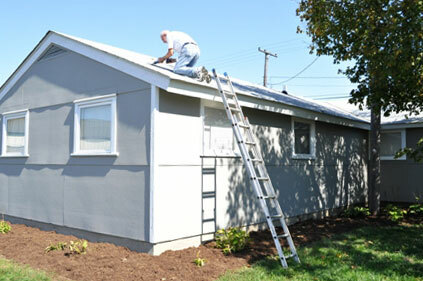 So building T-48, 69 years later, takes lots of maintenance to keep the only remaining barracks-style building in good shape. 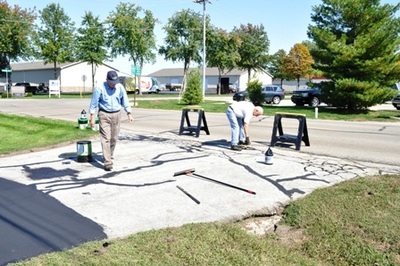 Museum volunteer Nick Firestone snapped some photos while helping with the work. The Jeanne Lewellen Norbeck Memorial Chapel is heated and air-conditioned with ADA approved restroom facilities, complete kitchen, chapel PA system, chapel organ with parking available on the street, or joint use parking lot behind the chapel. The chapel is located on the corner of Middle Road and Grissom Street at the Columbus, Indiana Municipal Airport. The chapel will seat up to ninety guests in the sanctuary. SPECIAL NOTICE: The Chapel is a museum and the only remaining 1942 barracks type building and the approval for use of the facility will be determined by the museum board of directors. 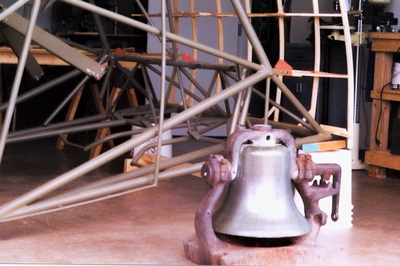 The original Bakalar Air Force Base Chapel bell was returned to its place in the Chapel belfry after it was recovered after many years of absence, dedicated in December of 2001, and dubbed The Chaplain H. Nathan Frederick Memorial Bell. 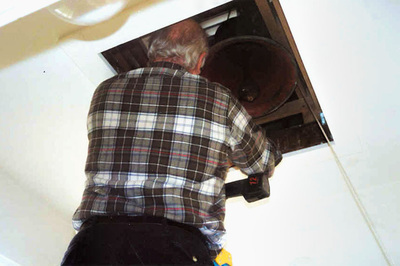 The bell was originally a locomotive bell that was put into service as the church bell. 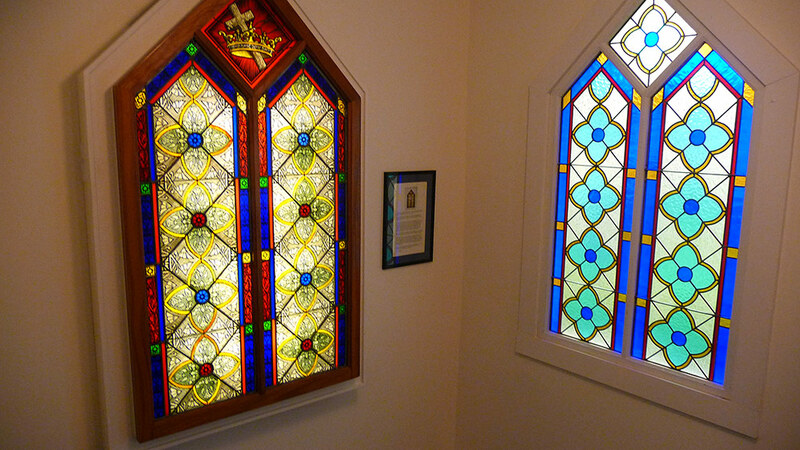 While visiting the chapel, please also note the original, stained glass window on display in the narthex, which is nearly 120 years old. 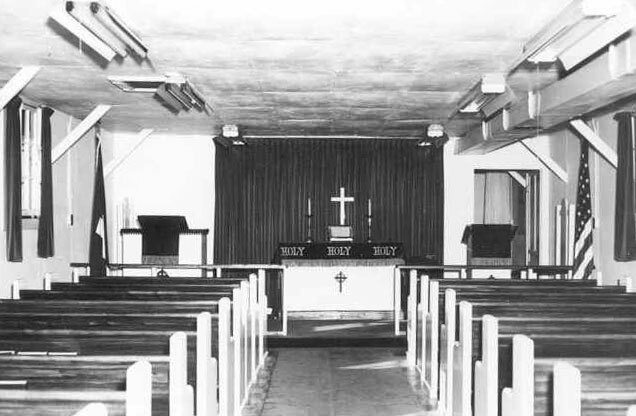 Bakalar Air Force Base Chapel in 1955. when still under Air Force control and used by Airmen. 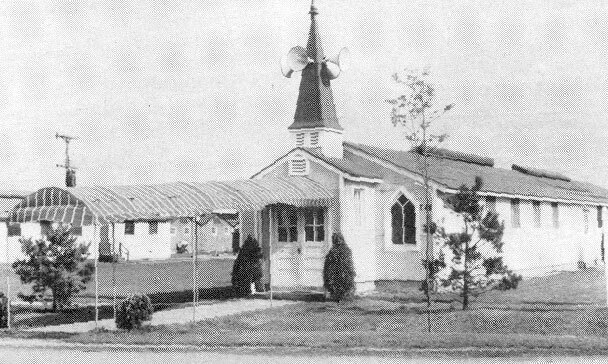 In this chapel photograph, note the canopy and speakers on the steeple. This is the only photograph the museum has of the chapel with the canopy. 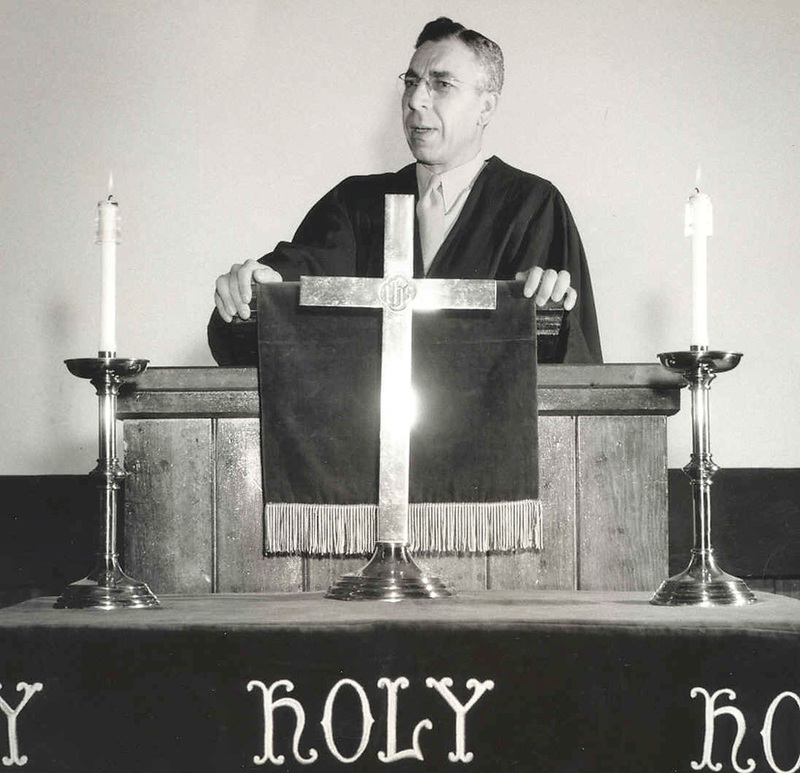 Chaplain H. Nathan Frederick in an official Air Force photo released by Atterbury AFB Columbus, Indiana in the 1950s. 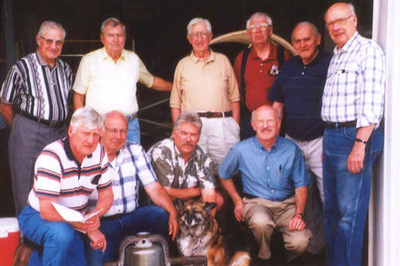 In July 1995, an exhibit of some of Jeanne's WASP materials was dedicated at the Atterbury-Bakalar Air Museum at the Columbus Municipal Airport, Columbus, Indiana. In May 1997, Jeanne's name was inscribed on one of the 25 columns of the Bartholomew County Memorial for Veterans on the lawn of the Bartholomew County Courthouse in Columbus, Indiana. Also inscribed on the memorial is an excerpt from a letter Jeanne had mailed to her mother the morning of the day she was killed. 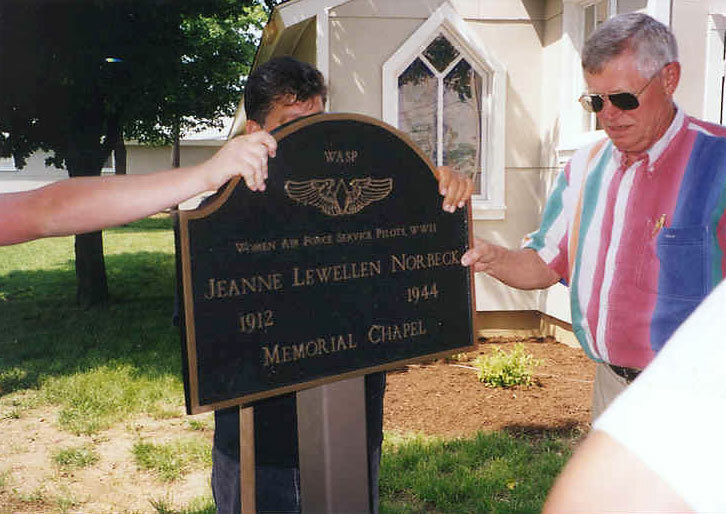 In May 1998, the restored chapel in a WWII barracks at the Columbus Municipal Airport was named the Jeanne Lewellen Norbeck Memorial Chapel and dedicated to her memory. 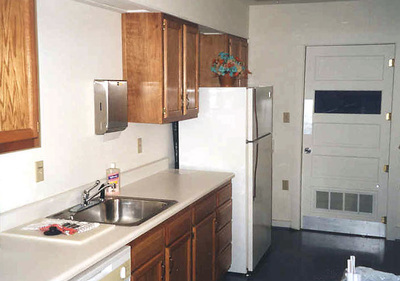 In June 1999, Washington State university featured an article about Jeanne in its paper, Hilltopics. C. James Quann, registrar emeritus, wrote the article as one of a series about alumni who gave their lives for their county.